Power File Search is compatible with Windows 10, 7 and XP. It has been reported to work on Windows 8 and Vista. 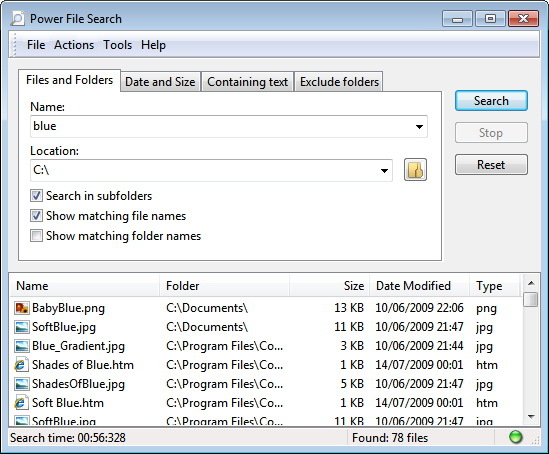 Power File Search (PFS) is a utility for searching files and folders. It's one of the fastest search utilities on the market, it has an intuitive interface that enables you to quickly set your search options, and -last but not least- it really finds the files you are looking for. What's wrong with the built-in search utility of Windows? Actually a lot. It is terribly slow, it lacks intuitive and convenient search options and it doesn't find all the files you are looking for. Have you ever had the experience of searching for that special file containing some particular phrase, a file you were absolutely sure about it was on your system, but Windows did not find it? That's likely because the Windows built-in search utility doesn't search in files with unknown extensions. Search for Files, Files and Folders or only Folders. PFS is lightning fast: it searches roughly 3 times faster compared to the Windows built-in search utility but it also beats its competitors. See the Facts and Figures section in the PFS help file for details. Intuitive interface: all common search options can be set with a few mouse clicks. Windows Explorer context menu integration. Search for files Newer than or Older than a number of Years, Months, Weeks, Days, Hours or Minutes, or within a specific date range. Search for files Larger than or Smaller than a number of GB, MB, KB or Bytes. Search for text in files (all files, not only in common file formats such as .DOC, .XLS, .HTML, etc.). The results window supports default Windows Explorer behavior (icons based on type, context menu, copy, cut, etc.). The results window supports also specific actions (e.g. Open Containing Folder). Export search results to clipboard, text file or comma separated file. To protect your privacy, the search history can be cleared on demand, or PFS can be configured to remove the search history upon exit. PFS uses few computer resources such as memory and hard disk space. Product lifetime free upgrade policy for registered users! Consult the Power File Search help file for an extensive description and more screenshots.